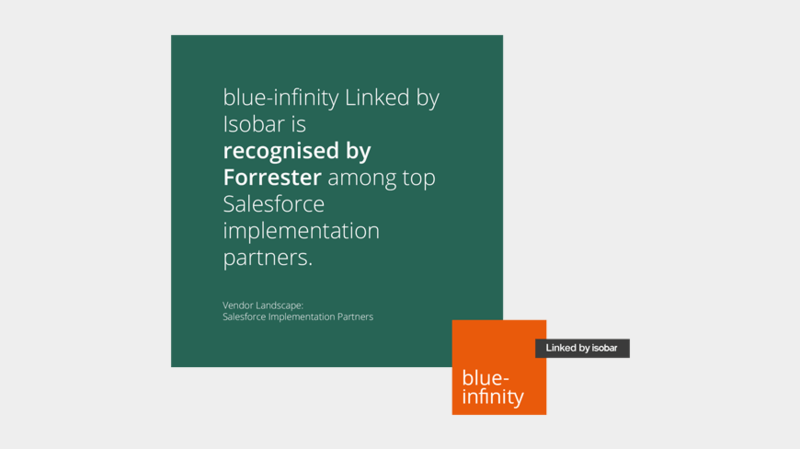 blue-infinity Linked by Isobar announced today that Forrester, one of the most influential research and advisory firms in the world, has recognised blue-infinity Linked by Isobar as a top Salesforce Implementation Partner. The ‘Vendor Landscape: Salesforce Implementation Partners’ report provides an overview of 39 companies from the business consultants, technology service partners and digital agencies categories, and their product capabilities for delivering Salesforce services. The purpose of the report is to give business and technology executives an understanding of the changing partner landscape, highlighting the key market changes in the past two years, as-well-as the shift in the Salesforce service ecosystem. Salesforce has a long history of empowering businesses to be agile, and to understand their customers better, and has now reinvented itself again to be a partner for digital business transformation, something key for success in the digital economy. Acquisitions, strategic alliances and partnerships have caused dramatic change in the Salesforce service ecosystem, and have made it increasingly difficult for application development and delivery professionals to understand the full capabilities of service partners. The report urges businesses to consider key elements when selecting a partner, including the type of firm they want to work with, product-specific knowledge, size, industry, geography and cultural fit. Frédéric Demierre, Partner & Salesforce Practice Manager, blue-infinity Linked by Isobar, says, “We’re honoured that an esteemed organisation like Forrester recognises us in this report. We believe our differentiated Salesforce value proposition helps brands and businesses embrace the full potential of digital. We attribute this recognition to our team of “cloud native” professionals, who are constantly seeking to push the boundaries of Salesforce solutions.​"